Ron Galimore was born on March 7, 1959. Willie Galimore, his father (a running back for the Chicago Bears) died while Ron was five in a car accident. 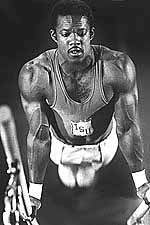 Ron Galimore also played football, but his first love was gymnastics. Galimore continued his involvement in gymnastics in college first attending Louisiana State and then later transferring to Iowa State. In 1981 he became the first gymnast to score a perfect 10 at the NCAA Championships. Galimore was standout athlete and gymnast. He was selected to represent the U.S. as part of the men’s gymnastic team in 1980. Galimore was considered to be a a strong contender for a medal there. However, the U.S. boycotted the 1980 Olympics to protest Russia’s invasion of Afghanistan. Galimore graduated from Iowa State, and eventually ran his own gym for a number of years in Tallahassee, FL. He was inducted into the Iowa Sports Hall of Fame in 1998. Ron Galimore currently resides in Indianapolis, Indiana and serves as the Chief Operating Officer of USA Gymnastics. Did you miss yesterday’s post? Click the link below to view the post; a thought provoking quote made by Martin Luther King, Jr.